Home Stories from Camp Be A GREAT Girl! If we were selling a product, Be a Great Girl would be our tagline. We have it incorporated into signs on every hill, in the architecture (bottom of the dining hall doors), and even in a hashtag #bagg that is used as a reminder like I used to say every time Gardner or Turner left with the car keys: “make good decisions”! “Hashtag bagg” can be heard in the same context as counselors remind campers, campers remind counselors and even each other to be great girls. I love it because it encapsulates what we are all doing here. It’s NOT the product, rather the process that we are passionate about…a very long process that gathers the most steam at this stage of a girl’s life, but that I would argue is really lifelong. And the foundation is SO important. Every minute counts, even those that seem like dog years. It’s unfortunate that those impressionable years are the same ones that moms and dads are working hard to make ends meet and to get ahead. Because you can’t short circuit the process in getting to the motherlode…a happy, healthy adult who makes amazing contributions to society beyond self and who will raise even more happy and healthy adults to do the same. Like almost all Illahee girls, Zoe LOVES camp. A former camper, I have known her since she was a “pup”: slightly taller than her peers, lanky, athletic…a happy kid from Charlotte. She came to camp with a friend named Jamia, who her family had recruited to camp and who in partnership with us, made it happen for a number of years. That life changing experience would never have happened without her family, and I know the mentoring did not stop at the end of camp. Zoe is now an engineering student and Head of Pineview, our oldest hill of girls. I’ve heard it said that we are drawn to people who share similar interests. As if being counselor to a a cabin full of older girls was not a full time job, add being the mentor to the entire staff of that hill and an activity counselor as well. She’s a runner, still loping off the miles, but I see her on trips out to the farm, which means she is running 4 miles out, and I assume…4 miles back. That’s NOT the interest we share. I guess it’s her engineering mind. I LOVE building, fixing, dreaming about how to make physical improvements to camp…but also how to enhance the program to make it even more special. All of us do. That’s why I can confidently say “best summer ever” each successive year. Because next year is going to be better than this one…it just will. I know she HAS to be tired. This past winter, I made eight “state park” charcoal grills for the overnight spots around camp. We demo-ed them during orientation, and we have spent some time the last few years rebuilding the overnight shelters to encourage cabins to do an overnight on our beautiful outlying property. I think Zoe was probably the first to use them. She has completed several overnights. She gave a cheerful pep talk during staff meeting last week about the possibilities for charcoal cooking…which included quesadillas for dinner and blueberry pancakes for breakfast. She has facilitated a number of cabins venturing out to add to their own overnight experiences. The other day, Zoe came up all bubbly… “I want to map all of the new trails at Hannah Ford Farm. We can do mile markers, and little metal trail signs.” Her excitement was contagious. I sent her Google Earth .kml files and the GIS mapping with contours to get her started. Today, again…how so bubbly? “I found these White Mountain ice cream makers under the dining hall, and we made custard with the CITs and it’s churning now! How cool would it be for every cabin after worship on Sunday to make their own ice cream to serve after Sunday lunch”?! I followed the excited group around to the back of Curtis, where indeed…a big stainless churn of ice cream was spinning with some eager girls watching its every turn. Zoe had talked to Allie, our cooking guru, and had borrowed her demonstration hot plates to make the custard. We talk a lot internally about “E.Q.” Emotional Intelligence. What makes Zoe see (and better yet) pursue the possibilities? She’s not wonder woman…she’s had some struggles…a challenging cabin situation here or there. And she persists…to make this…the BEST summer ever. I know because she has shared in Bible study…that her foundation is a strong faith. I don’t know that I can tell you the entire story. But I do know that there are some lucky girls on Pineview that are delighting in the “possibilities” this summer. 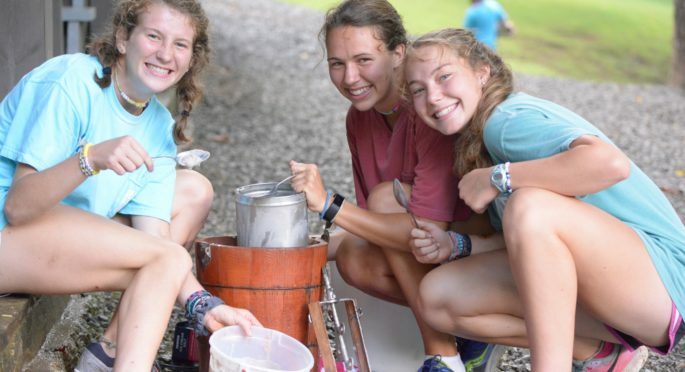 So I singled Zoe out because watching her eat delicious homemade ice cream with the CITs and then tell me her “ice cream dream” for the entire camp was fresh on my mind. Why not? There are plenty of reasons to say “no.” But my job is to say “yes” if I can. And there are so many others who are working hard to make this the Best Summer Ever for your girls. So, here’s to each one with a big heartfelt thanks…because it is, after all about the process. Today was busy! There is a lot going on at this point in the session. Running Club took a field trip…off camp with Becky to do some trail running in Pisgah. And some more seventh grade cabins went on the seventh grade hike with Beau and Ruby and Shelby to high Pisgah. They hiked the Black Balsam trail and then cooled off in Skinny Dip Falls…a cascading waterfall with the perfect rock to initiate a plunge into a cold mountain stream. Our paddlers are gearing up for a trip to the Chatooga tomorrow, one of the most beautiful rivers in the east…designated wild and scenic. We had our first rain in a week today…a frog strangler that is typical of a warm summer day in the mountains. It had finished its course by the end of rest hour, but not before dumping an inch and a half. Luckily, blue skies prevailed for afternoon activities, so we didn’t miss a beat. Our Hillbrook girls are at Sliding Rock and Dolly’s tonight…Heigh Ho is spending an overnight at the farm… and Pineview is finishing a night of “stoopin it” (chillin on Pineview with lots of activity choices) with a raucous dance party that is literally twenty feet from where I am blogging (on the other side of our window out on the common area between Pinecrest and Pineview Lodge). So, I’m going to end there…mainly because I can’t concentrate and may keep blogging to the beat! 4th of July at Hannah Ford Farm! How Many Activities Can YOU Do at Camp Illahee?